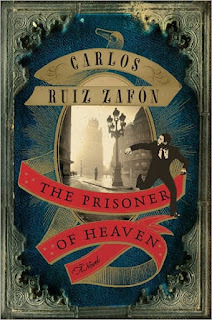 Though I prefer to pick up Carlos Ruiz Zafón's novels in the fall, preferably on a rainy day, I couldn't wait to read The Prisoner of Heaven this summer after attending an author event at my favorite local indie bookstore on the day after this novel was released. I hadn't realized how much I missed the characters he had created until he was speaking of them as old friends. 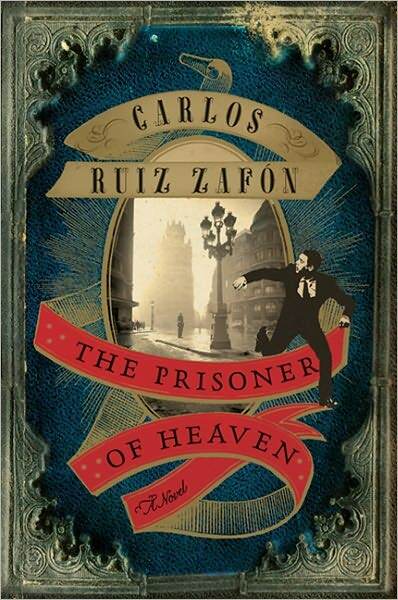 I was tempted to reread The Shadow of the Wind and The Angel's Game but CRZ was clear that the books could be read in any order so I thought I would be fine just reading this new one. 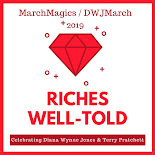 Well, I was completely fine with starting right into this book but I am still going to need those rereads because I also remembered how much I love this story and I didn't want to be done with it when I turned the final page. I don't want to give too much away because I know that many of you have the other two books on your TBR lists. I'll just say that Daniel Sempere, the main character of Shadow, is an adult, working in the family bookstore with his father and his friend Fermín Romero de Torres. Fermín is due to be married soon but must resolve something from his past first. To help him, Daniel must delve into the past and into the history of author David Martín, the man we got to know in Angel. This story treads a bit of new ground in the present but mostly fills in the mysteries of the past, things that cannot help but affect the future. I really enjoyed this book and what I was able to learn about all of these characters that I thought I already knew. The writing was amazing as always and I'm as much of a CRZ fan as I ever was. If you are also a fan of this series already or if you want a quick introduction to the place that readers of these stories can't stop dreaming about, The Cemetery of Forgotten Books, be sure and download the free short story Rose of Fire. It's set in the fifteenth century and documents the origin of that special place. And when you fall in love again, pick up one of these novels for a read or a reread! I have to try this author. Ever since I read your post about the giveaway, and I saw Shadow mentioned in another blog, I've been thinking I have to get this! So many books I want to read. Squee! So great :-) Also somewhat relieved that you were fine reading this without a reread of Shadow of the Wind. I don't think I have the patience to read the prequel first! Yet another series of books I need to read at some point. Sigh. Missy - It's a great series! I hope you find the time for it at some point. Aarti - Yeah, I was prepared to be a lot more confused than I ended up being. I'm glad you can jump right in too! Al - Then stop writing them. ;) Just kidding. Keep writing! I loved the first two, am def going to get this one! Thanks for the heads up!